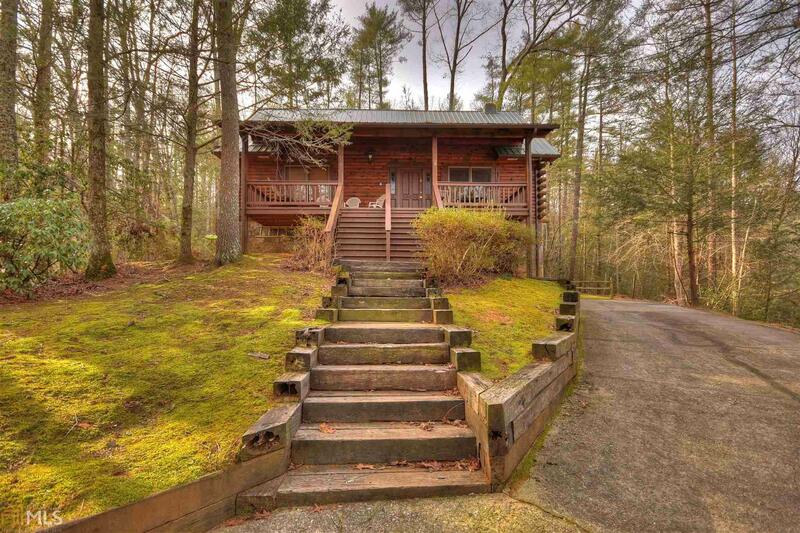 Classic Log Home overlooking the rushing, wide waters of Mountaintown Creek!! Incredible setting w/ huge boulders, rock outcroppings, mountain laurel and rhododendron along the private path down to the water. Open & inviting floor plan w/ a MASSIVE rock fireplace as the focal point. Spacious kitchen, large bedroom and full bath w/ a claw foot tub, separate shower & double vanities round out the main level. The second level features 2 more bedrooms & full bath w/ a second clawfoot tub! The terrace level is finished except for the ceilings and offers a game area, sitting area and 3rd full bath. Private hot tub and a rocking chair front porch. 2 lots, but only 1 association fee. Gated community featuring pools, river access, tennis. Existing vacation rental. Directions: From Dairy Queen Take Old Hwy 5 S Approx 1 1/2 Miles To A Rt On Legion Rd. Follow To Crr Gate. Enter Gate & Stay On Newport 1.8 Miles To A Rt On Fir. Bear Lt After Pavement End & Take A Rt On Birch Ct. Take 1st Lt On Cabin Ct. Home Is In Cul-De-Sac On Lt.